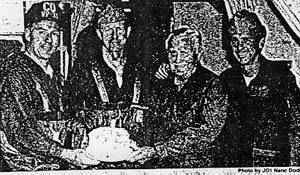 A BIT OF HISTORY: "...Jay R. Beasley - Mr. P-3 Still Flying High at 70 - NAVY TIMES September 24th, 1984..."
On the occasion of his 70th birthday, Jay Beasley (second from right) accepts a cake from Cmdr. E. R. Enterline, CO of Patrol Squadron 31. 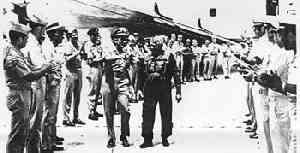 He was saluted after completing a flight in a P-3C Update III. 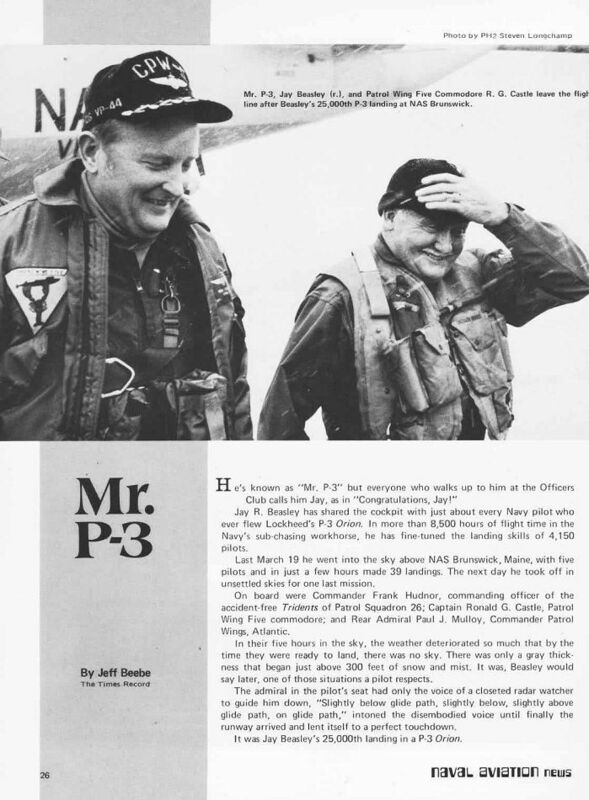 Beasley, known as Mr. P-3 by the many Navy pilots he trained in the Orion, is flanked by Como. 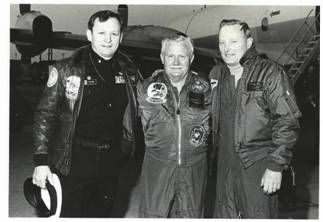 Oakley Osborn, Commander Patrol Wings Pacific, (left) and his son, Cmdr. Jay Beasley Jr., USNR. He is Honorary Naval Aviator 11 -- an honor which allows him to wear Navy pilot's wings. A BIT OF HISTORY: "..."The Skippers Notepad - The Summer of '32 - The Patroller - March 26, 1981 By Captain Norman E. Koehler, III..."
1932 was a difficult year - not one with a lot of character or pizzaz. 1929 - now there was a year! The "crash" of course, and almost everyone remembers. What about December 1941? The Day of Infamy - who could forget! Then there are 1776, 1812, 1861, 1914, and 1939. The details may blur but the apocalyptic brushes with war which seem to puncuate our history come immediately to mind. Thanks to Hollywood "The Summer of '42" inspires a melancholy smile, a wistful minds-eye glimpse of that "special moment" in life when love transforms from notion to reality. But what of the summer of '32? It was in the summer of 1932 when a 17-year-old self-styled aviation enthusiast flew an airplane "solo" for the first time. Forty-nine years and 18,500 flying hours later Jay Beasley has writen yet another record into the books here at NAS Brunswick when he logged his 25,000th landing in the P3 one week ago today. Last summer our venerable old P2 at the Main Gate monument area doffed Jay Beasley's name and a hundred young men and women asked, "Who's Jay Beasley?" During the past week Jay has received the accolades and the recognition locally which he so richly deserves. This author is proud to be one of the some 4,150 naval aviators who are better pilots for having been trained by "Mr. P3." But his service to patrol aviation predates the P3 Orion. I first flew with Jay in 1962 in a P2V-7 Neptune. I didn't even get to the cockpit on that flight. I was so junior that I had to watch. RADM Mulloy who made the 25,000th landing with Jay last week also remembers the "P2 days" - (the Admiral actually got to fly with him). We all were touched by his personal charm, disarming wit, and absolutely astounding appreciation of "how to fly." He is one of a kind - a God-given talent. To use the sports analogy, we have our very own "Dr. Jay," and we have had him for three decades. He is a profesional's professional - but in a humble, sincere, and thoroughly credible way. We hold him in highest esteem. No one who has known him can recall such total respect - we for him and him for us. And there is the secret! That is the heart of the man. We love and revere him because he has shown us such respect and admiration. We labor so to live up to his high standard because he has labored so on our behalf. He is singularly outstanding aviator and educator - but he is unique as a caring and selfless human being. Want to fly the P3 better? Fly with "Mr. P3." Want to be a better person? Pay a mind to one of the best the Good Lord ever put among us. You have done some pretty super things Jay! But we admire you most for what you are. Yes, there was some pretty persistent magic at work in the summer of '32. 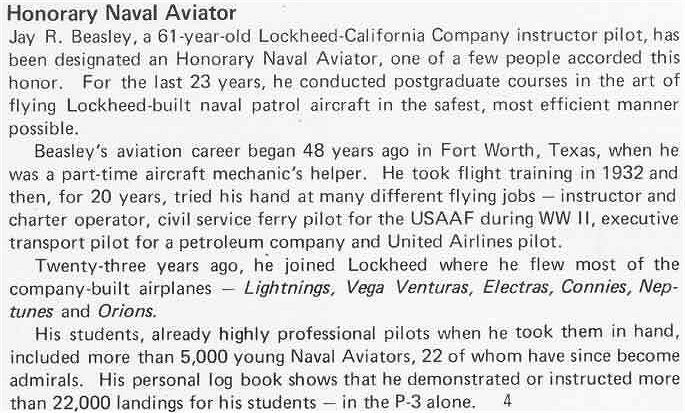 A BIT OF HISTORY: "...Jay R. Beasley - Jax Air News, February 14, 1980 by Sabina Corini - February 14th, 1980..."
Jay Beasley, known in patrol plane community as "Mr. P-3 Orion" was recently honored by the VP-30 Pros with a squadron plaque officialy naming him "Pro of Pros." Beasley rejoined the VP-community for a "short tune-up" when he shared the month of January with the Pros of VP-30. It was a happy reunion since flying has been a major part of the man's life. When the P-3 was born to the fleet, Beasley was assigned as a senior instructor to VP-44. After the original training, he continued visiting squadrons for a week each year giving lectures and flying with each of the squadron pilots until retiring from Lockheed in mid 1975. At that time he had accumulated 17,500 hours, with 7,800 of them on P-3s and Electras. During the first six months of 1975 he made 2,171 landings with 342 Naval Aviators, bringing total P-3 landings to 22,886. In 1932, Beasley made his solo flight at Ft. Worth, Texas. Since then, he has continued to advance his aviation capabilities. Even before he was hired by Lockheed in 1943, he was a licensed airplane and engine mechanic, a ferry pilot for the Air Corps, an American Airlines mechanic, the youngest licensed passenger pilot, first officer flying DC-3's, DC-4's and DC-6's for American Airlines, and an executive transport pilot for a petroleum company. At Lockheed, he flew as a test pilot on P-38's, Hudsons, Venturas, and B-17's. 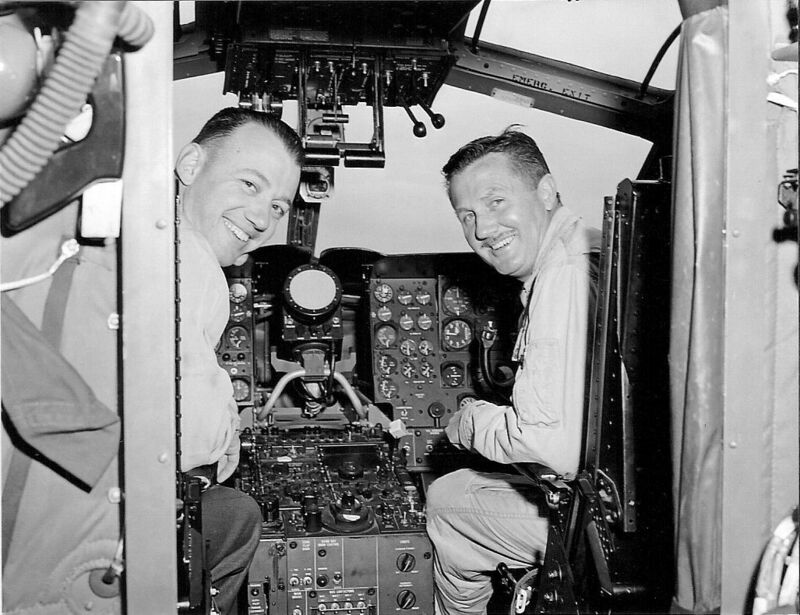 "Mr. P-3 Orion" was also kept busy training Navy pilots on the Super Connie and Willie Victor aircraft. Besides training naval aviators, he spent many hours instructing pilots of the world's major airlines. 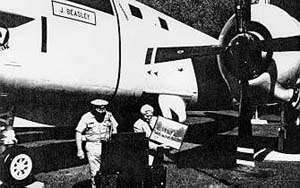 In 1952, Lockheed sent Mr. Beasley to the fleet to instruct and demonstrate the P-2. "We just left all the circuit breakers in and oncentrated on flying the airplane." Later, he continued making demonstration flights six times daily, taking three pilots at a time. Two years ago, he rejoined Lockheed as a consultant for assisting the fleet Squadrons in pilot, and engineer training. He has recently been requalified as an instructor pilot to fly with the squadron instructor pilots. 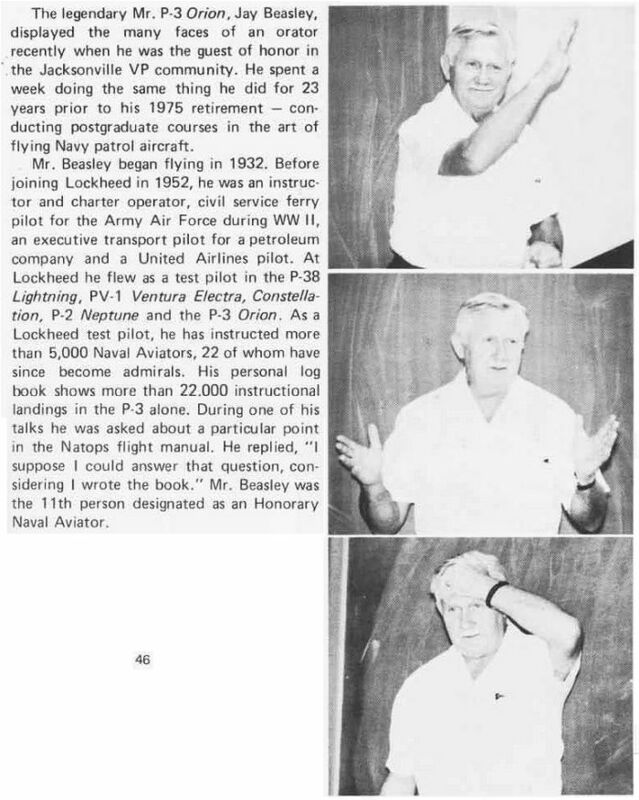 A BIT OF HISTORY: "...Jay R. Beasley - Jay Beasley, test pilot visits NASB By JO1 Len Churilla - The Patroller - October 23, 1980..."
Mr. Jay Beasley, a test pilot and consultant for Lockheed Corporation for the past 28 years, paid a visit to NAS Brunswick last week. Mr. Beasley is noted for his special techniques in training Navy pilots to fly aircraft under adverse conditions and unusual circumstances. As a test pilot Beasley has flown with over 4,000 P-3 pilots since he began his flying career. Interested in flying while he was still in high school, he started out washing aircraft and later became a mechanic. He became a project pilot in 1944, flying P-2's. During World War II he ferried airplanes for the Air Corps as a civilian. He joined Lockheed in 1952. "I was flying with Admiral Mulloy and Admiral Hedges when they were junior officers." said Beasley who indicated that he was in Brunswick for the VP-23 change of command ceremony and to help train some of the newer pilots with VP-26. "As I see it," said Beasley, "my job is to show the younger pilots how to do something easier and to be prepared for the unexpected. Some of the newer Navy flying instructors may spot some of the problems that new pilots have .....them. That's where I...With my years of experience flying patrol planes under all conditions I can teach them the special tricks." 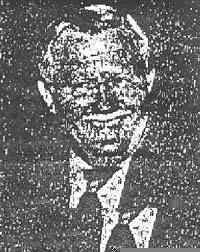 Married to the former Allene Aubrey of Glendale, California, Beasley has a son with American Airlines who used to be a Navy Pilot. To honor Mr. Beasley during his visit to NASB his name was painted on the P-2 aircraft near the main gates of the station. Beasley plans to be back in Brunswick in 1981 for two visits of two weeks each in which he plans to reach all six patrol squadrons homeported here. A BIT OF HISTORY: "...Jay R. Beasley - An Old Pro Gets His Wings - Airborne ASW Log August 1975..."
After his final training flight in a Navy Orion, Jay Beasley received a squadron-size farewell from VP-24 as he left the airplane with CAPT R. A. Martini, Commander of Patrol Wing Eleven at NAS Jacksonville. Retirement parties tend to follow a pattern. The graying veteran accepts gifts and mementos from his friends and co-workers and boss. A spokesman for the assembled well-wishers, usually the boss, reminisces a bit. And finally, the retiree himself, putting the best face he can on what is probably for him a less-than-joyful event, steps forward to write finis to a major fraction of his life. He gave the best that was in him to a vital segment of Amerrican defense. But now it is done. Some one else must carry on. And he tells his friends he will miss them and the adventures they shared. When Lockheed's Jay Beasley retired in July, the party at San Fernando Valley's Sportsmen's Lodge followed the pattern; but there were some significant departures from normal. One of the testimonials was delivered, of course, by Jay's boss. But he was preceded at the podium by a Vice Admiral and by the president of the corporation. The friends and co-workers who heard these tributes were at least half from the Navy; and they ranged from JGs to Captains to a retired Admiral. The mementos were a bit out-of-the-ordinary, too. There were nearly a hundred letters from pilots, safety officers and the Commanders of squadrons, wings and fleets. And there were plaques, pictures and scrolls -- even a framed original poem -- from squadrons throughout the VP Navy. Recognition from so many individuals and from so wide a spread of organization levels is usually reserved for fleet commanders or corporate officers. But Jay Beasley is a pilot -- a professional pilot with reason to be proud of the way he shaped his life around his profession. Jay is a pilot's pilot in the truest sense of the word. In fact, Lockheed's prresident, Carl Kotchian, confessed that Jay's job was one of the very few that the company has no way of filling immediately. Jay built the job, and for the foreseeable future, there's no replacement. Obviously, the Navy holds similar sentiments towards the old pro. For example, VADM E. C. Waller III opened his talk by saying "About four weeks ago, Dave Kenyon called me and said 'Jay Beasley is going to retire;' and I thought, 'Why, Jay Beasley can't retire!'" One squadron augmented Jay's supply of memorabilia by making him an honorary Patrol Plane Commander. And recognition came, too, from the very top of the Navy's chain of command. The CNO's office approved the recommendation of CAPT T. D. Luckett, Burbank NavPro, that Jay Beasley receive the golden wings of Honorary Naval Aviator. VADM Waller presented the insignia to Jay and to his wife Allene. Jay is only the eleventh civilian pilot to be so honored since World War II. And to be sure that no visitor to the Beasley home departs in ignorance of this tribute, a replica of the insignia with a three-foot wingspan and a polished walnut supporting plaque was unveiled. If you look back, you can see why such singular honors were heaped on this quiet and unassuming man. Early in his flying career he was an Army Air Force civilian ferry pilot and a Lockheed P-38 test pilot. Fighter jockeys weren't much in demand when World War II ended, so he went to work for American Airlines. VADM Waller remarked that the finest thing that airline ever did for the Navy was to release Jay to return to Lockheed. He was one of the first test pilots to fly the company's new post-war ASW patrol planes. And this led, almost inevitably, to a love affair with the VP Navy that was to continue for more than two decades. "I don't know how many hours I've accumlated in patrol planes," Jay confessed. "I got up to 5,000 hours and then lost track." How does one pile up so many hours in the air with this bird? It's not easy. Jay Beasley did it by spending, these past few years, thirty weeks per year with U. S. Navy squadrons -- one week per unit. There's hardly a pilot in the Navy's land-based ASW flying community who has never seen Jay in action. His demonstration flights have been staged at virtually every VP base and deployment site. And his post-graduate course instruction has included over 5,000 pilots, 22 of whom have since risen to Flag rank. A recurring theme in the letters from the fleet and in VADM Waller's remarks is the point that Jay's somewhat unorthodox teaching methods have paid off handsomely for the Navy. Squadron commanders and training officers frequently asked him to fly as IP with a pilot who had a problem. Sometimes it was an over-confident type with a shakey grip on the realities; sometimes a promising newcomer with a shakey grip on his confidence. Jay's instinct for the right approach -- joking or crusty or gentle -- often became the turning point in the career of such a man. It is unlikely that Jay Beasley will soon forget the ceremony that took place on 25 July at the plush Southern California bistrro. It is hardly more likely that the crowd of Navy visitors will forget -- they are stuck with the job of finding an alternative for the valuable company asset they had in Jay Beasley. A BIT OF HISTORY: "...Jay R. Beasley - The Admiral Recalls - Airborne ASW Log August 1975..."
VADM E. C. Waller II, recalling an incident that occured while he was CO of VP-44, spoke directly to Jay Beasley: "I asked you to look closely at one of my junior pilots who was having trouble in the landing pattern - so much so that we wondered if he was going to make it. "Your advice to me after your flight with him was superb. We made him into a good pilot...He was recently selected for CDR and will be a front-runner for Flag rank." "I personnaly believe that your advice saved this magnificient Naval officer. A BIT OF HISTORY: "...Jay R. Beasley - Jay's Big Boss Speaks - Airborne ASW Log August 1975..."
Carl Kotchian, President of Lockheed Aircraft Corporation, said: "Given the number of people who have become pilots since aviation's birth, there may have been many whose flying skills are the equal to Jay's"
"By the same token, there have been many pilots who are good instructors with the ability to communicate their knowledge and skills to their students quickly and effectively." "And there are some whose qualities of character and personalality enable them to establish immediate rapport with their associates." "But no one I know combines the equal of Jay's flying and teaching skills with his special qualities of character and personality that made him so uniquely fitted to the work he has done for that past 23 years." 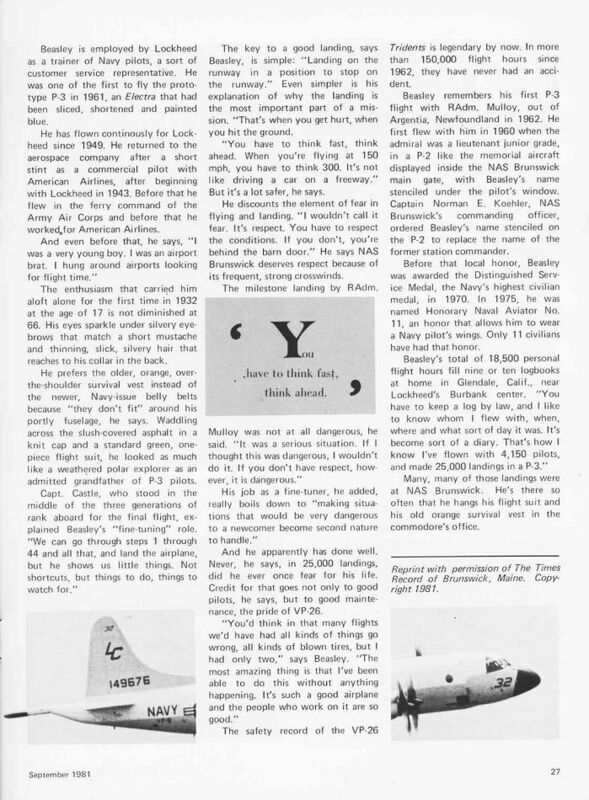 A BIT OF HISTORY: "...Jay R. Beasley - The Word From Jay - Airborne ASW Log August 1975..."
"Sometimes," Jay said, "people have asked me how it feels to spend so much time living with the Navy and flying their airplanes." "Well, I can only recall one time when it seemed a little out-of-the-ordinary." "I was flying co-pilot with the commander of this squadron that had just received its first P-3. The local people were enthusiastic; and a big ceremony had been organized. We picked up a high school band from a nearby city to take part in the proceedings and carried them down to the base." "Everything went off beautifully; but when it was over, we still had to get the band back home. So the skipper said he still had a lot of things to take care of there at the base and how about if I ferried the band home." "But after I got airborne and sucked up the gear, it suddenly hit me. There I was, with this load of kids and instruments in the back; and after all, I was really a Lockheed employee, but this brand new airplane didn't belong to Lockheed any more -- it was owned by the Navy. If I wrinkled it up, somebody would fry." "I can tell you, I flew very carefully the rest of that flight. But that's about the only time I ever felt as if there was anything unusual about what I was doing." Editor's note: Minor changes in the narrative mask identities and places. But the flavor and sense remain intact..."
APRIL 25th, 1973 (Wednesday): Day of departure for NAS Cubi Point, Philippines. Everyone finishes saying goodbye to their families (who are now watching from their cars) and huddles on board our fully loaded P-3A. Just as we commence our plane-side brief, FE Gary Davidson discovers a fuel leak, which hard downs the airplane. Ops-O Bill Boyd directs us to delay our departure until the next day after repairs are completed. I say, "No way-I don't want crew and families to have to suffer through good-byes again. Give us another airplane." He agrees. We preflight ZE-1, reload and go. ZE-4 launches 20 minutes behind us, then loses LORAN. Using UHF-DF, we lead ZE-4, trailing us by 200 miles, all the way to NAS Agana, Guam. FOLLOW US! While refueling at NAS Agana, Guam, attempt to file a stop-over flight plan and get an extended weather brief -- destination NAS Barbers Point, Hawaii with a 6-month delay at NAS Cubi Point, Philippines. Base Ops has no sense of humor and won't go for it. Finally arrive NAS Cubi Point, Philippines at 2130 on 26 April, having lost Thursday due to crossing the International Date Line. Checking in at BOQ, I spot former flight training classmate Jay Beasley Jr. (now flying for VR-21) asleep on the couch in the lobby-in exactly the same place and same fetal position he was in when I last saw him 9 months ago at the end of a detachment to NAS Cubi Point, Philippines during our 1972 NAF Naha, Okinawa, Japan deployment. Has he been off this couch since then? Is he alive? 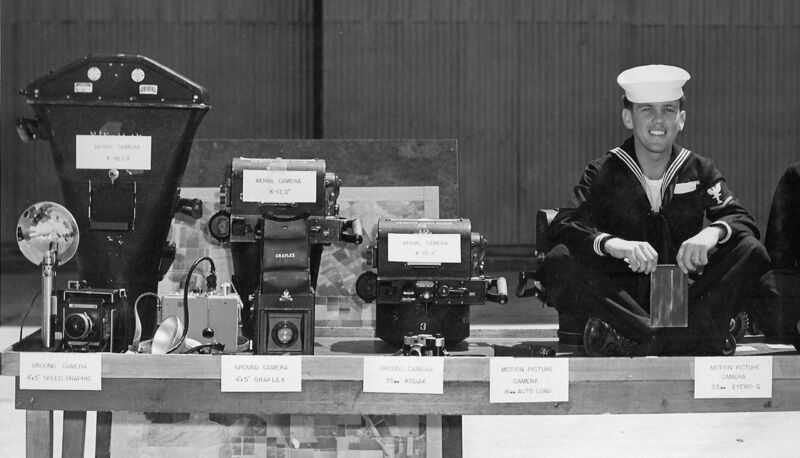 A BIT OF HISTORY: "...Jay Beasley Receives Navy's Distinguished Service Award. VAdm E. P. Aurand, right, congratulates Jay Beasley, Calac production test pilot, on receiving the Navy's highest civilian award. Beasley personally trained 850 P-3 pilots. July 22nd, 1971..."
Jay R. Beasley, production test pilot in Dept. 98-36, this week was presented with the Distinguished Public Service Award -- the Navy Department's highest award for civilians. The citation was signed by Navy Secretary John Chafee. VAdm. 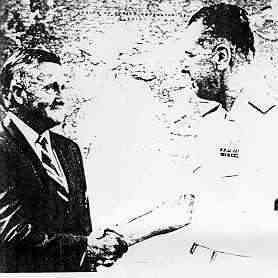 E. P. Aurand, commander of ASW Forces, U. S. Pacific Fleet, presented the award on behalf of Secretary Chafee to Beasley during ceremonies at Moffett Field, Sunnyvale. The citation reads in part: "For distinguished and outstanding service to the U. S. Navy Antisubmarine Warfare effort while serving as the lead pilot of a Lockheed California Company patrol aviation operational training team during Pacific Fleet transition to P-3 Orion aircraft during 1963-1969. During this period Mr. Beasley was personally and directly responsible for the operational training of 850 pilots." Bealey's career as production test pilot and instructor for Calac spans 21 years. Beasley's aviation career started when he was 13 and obtained a part-time job as an aircraft mechanic's helper in Ft. Worth. Since then he has compiled a total of 39 years of flying experience. During his aviation career he has worked as an instructor, an executive transport pilot for an oil company, and as a charter operation and commercial airline pilot. During World War II he served as a civil service ferry pilot for the Army Air Corps. Officers attending the award ceremonies at Moffett Field included VAdm. H. E. Shear, director of ASW programs for the chief of Naval Operations; VAdm. Fred G. Bennett, commander of ASW forces, Atlantic Fleet; Capt. Robert Ney, commander, Fleet Air Wings, Pacific, and commander of Fleet Air Moffett. Representatives from Calac included J. Fred Lashley, vice-president and general manager for Navy programs; Walter Schoch, P-3 Orion program manager; Dave Kenyon, manager of ASW-U.S. Navy Sales; and rRay Neale, chief pilot of flying operations. Techniques used in the landing a P2V differ slightly from those employed for other airplanes of the same category. This difference lies in the use of the varicam, which may be thought of as a trim device during cruise flight, and as part of the elevators during landing. The varicam surface, which is hinged between the horizontal stabilizer and the elevators, tolerates a wide range of C/G. Operated by hydraulic motors, its speed of travel is approximately one-half degree per second. (In older series, electric motors are used with speed of travel about 1-degree per second). Thus, some amount of anticipation must be used during the flareout and touchdown. It is not desirable to "lead" with the varicam to the extent that the pilot would be exerting forward pressure on the yoke -- the proper technique is to keep the airplane trimmed throughout the approach, applying nose-up varicam as the flare is rounded out. The amount required should be proportionate to the amount of elevator required for the touchdown, which will vary with the C/G, speed over the fence, approach angles and flap extension. A smooth landing with full flaps extended is improbable without the use of varicam due to the limited effective area and up-throw of the elevators. In general, most hard landings are caused by an insufficient amount of up elevator -- in this case, varicam -- prior to reducing the power during the flareout. This can be the result of dragging the airplane in a final approach with a necessarily high power setting; when the power is reduced, the nose drops and there is not enough time to apply nose-up varicam. Many of the P2V landing accidents have resulted from normal approach landing patterns being interrupted or modified. Therefore, straight-in or modified approaches should not normally be employed during VFR when it is practicable to make a normal approach pattern which includes a downwind leg. (Practice straight in approaches should be included in supervised training to provide pilot experience for emergency landings and instrument letdown or GCA finals.) Pilots are especially cautioned to beware of the expression "3-(or4-) to-go" when completing the landing checkoff list! For a normal traffic pattern approach, extend 10 degree flaps early on downwind leg and attain a desired speed of 150 knots, 1000 feet of altitude above the runway elevation. With a setting of 2200 rpm, Mixture: NORMAL, this should require approximately 25" Hg. Manifold pressure. Abeam the approach end of the runway, extend the landing gear, obtain a gear check from the crewmembers, and complete the landing checkoff list. Without changing power, the airplane will slow up about 10 knots and commence descending at about 500 fpm. As soon as the wheels are down and checked, turn into base leg and extend flaps to 20 degrees which will slow the airplane to about 130 knots. Flap extension causes a momentary nose-down pitch which can easily be trimmed out with the varicam. Make the turn into final at 125 knots and extend full flaps at pilot's discretion. Increase cross the fence at 105-110 knots. During flareout, apply nose-up varicam and continue the power reduction. Approximately 4 to 6 degrees of up varicam will produce a smooth landing. Jet engines are not customarily used when landing due to possible jet engine damage incurred by foreign objects being drawn into the jet air intakes when reverse thrust is applied to the reciprocating engines. Jets may be used on touch-and-go landing or when emergency situations dictate (i.e., loss of a reciprocating engine). Touchdown should be accomplished on the main mounts, with the nosewheel 6 to 10 inches above the runway. Fly the nosewheel to the deck, don't slam it down or drop it by releasing back pressure on the yoke. When all three wheels are on the runway, the copilot will, upon command of the pilot, hold the yoke slightly forward of center position while the pilot mans the nose steering, brakes, rudders, and reverses the props (if applicable). When reversing propellers, determine positive reverse prop action on both engines before applying any appreciable amount of power. Should the reversing mechanism of one prop fail to actuate and high power is applied, and extreme turning moment is experienced due to one prop reversing and the other exerting forward thrust with manifold pressure supplied by the reverse thrust throttles. The large rudder area of the P2V provides excellent directional control during most of the rollout -- a fact too frequently overlooked by pilots experienced only in use of reverse thrust and/or brakes. It is suggested that reverse thrust be used on all full-stop landings in P2Vs equipped with reversible propellers. Reverse thrust being most effective at high speeds, it is desirable to apply this force as soon as practicable after touchdown, when the nosewheel is on the runway. Generally, 1500-1700 rpm adequately stops the airplane on the average runway. Hold this power setting until slowed to about 50 knots, then un-reverse. Apply brakes when required. Caution: Never apply reverse thrust before the nosewheel is on the runway! Reversing with the nosewheel almost on the deck will cause it to be slammed down. In order to assure satisfactory go-around performance, keep the airplane in trim throughout the approach. Excessive varicam on final can aggravate pitch-up when normal rated power is applied and flaps are retracted. The magnitude of this pitch can vary from slight to severe depending upon the amount of varicam cranked in. With full varicam, the pitch-up will be uncontrollable if the flaps are retracted before retrimming the elevators. At the initiation of a waveoff, retrim the varicam as power is applied. When it is assured that the aircraft will not contact the runway, retract the gear. After gear is retracted, raise flaps to 20-degrees, retrimming simultaneously. Rise flaps to 10 degrees keeping the airplane in trim and continue acceleration to climb airspeed. In the normal CG range, a P2V can be flown in straight and level flight at 120 knots or less with full UP varicam and full flaps. Remember that all low airspeeds, full flaps cause nose-heaviness. Any reduction of flap setting, without a reduction in UP varicam, will cause tail-heaviness. The Wright brothers found it necessary to use a lot of body english to aid in the trimming of their aeroplane. We have it easy -- just press that little button in the right direction. Touch-and-go landings are made the same as normal landings up to the time the wheels are on the runway. As the wheels touch down, the copilot will, when directed, put the flaps up to 10 degrees, center the varicam and indicate to the pilot that everything is ready for takeoff. The pilot will then apply takeoff manifold pressure. Before the installation of ASC 573 which provided the copilot with a varicam control on his yoke, it had been a practice for the Plane Captain to center the varicam with the switch installation on the pilot's pedestal. This was at best a poor arrangement since it required the Plane Captain to quit his ditching/landing station and brought an extra person into the cockpit during a period of increased activity. The takeoff from a touch-and-go landing is normally made with 2600 rpm, but full low pitch may be applied in an emergency situation. A recent instruction in some commands requires an intercom report from an after-station watch that both flaps have retracted to the 10-degree setting before power is applied. This is to prevent the possibility of split flap configuration should one flap retracting mechanism fail. Due to the increased pilot activity and concentration during the landing, it is imperative that rigidly standardized procedures be followed by all crewmembers -- particularly by the pilot and copilot. During the checkout phase of new pilots, procedures must be learned in such a manner and sequence that the pilot knows exactly the response he can expect from standard instructions given to the copilot, and the copilot can readily understand the instructions the pilot gives. There is a ditching landing station with safety belt assigned for each crewmember of the aircraft, and the pilot should require the crew to be in their stations, belts fastened! If flight discipline is relaxed, it will usually be first apparent by the Plane Captain taking an unauthorized, unsafe position between the pilot and copilot to "watch" the landing. 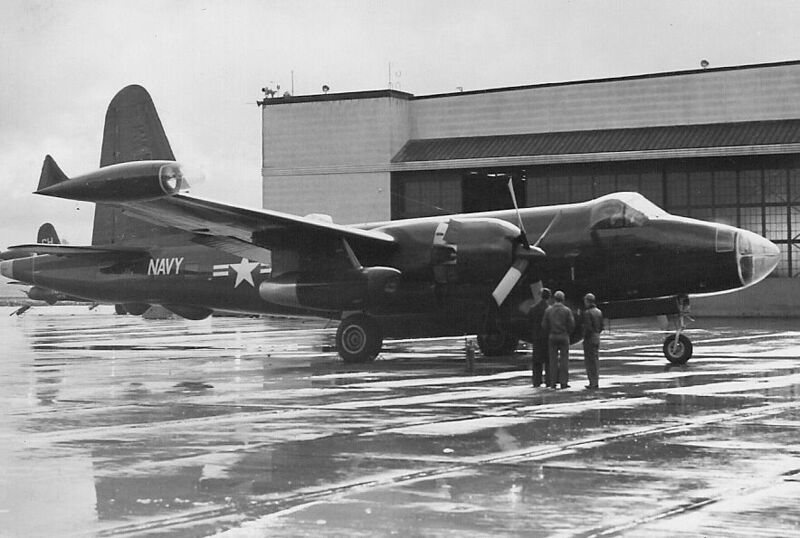 In 1953, prior to the installation of jet pods, BuAer asked Lockheed to conduct a demonstration tour of all domestic and to most foreign P2V bases. Over 100 feathered prop landings were executed without incident during this tour. Landing with a feathered prop is not a serious matter providing a normal traffic pattern is flown. It is imperative to use exactly the same procedures and maintain the same altitudes and speeds used in a normal two-engine approach. Case histories reveal that in all the accidents or incidents which occurred on landing with one prop feathered, the airplane overshot the runway in some degree. This, of course, is caused by the normal pilot reaction of approaching too high and too fast. In addition, there is the obvious absence of air braking from the feathered (vice windmilling) propeller, and there is added lift being developed by the (smooth, uninterrupted air flowing over it). The combination of these forces causes the airplane to float unexpectedly on the landing. Add excess speed and altitude and the problem becomes critical. With the present jet engine equipped airplanes, it is recommended that the jets be used for single "recip" engine landings. The added safety factor of being able to waveoff at any time should eliminate the tendency for the pilot to approach too high and too fast. A good procedure is to use 60-65 percent jet power on the side of the good engine and use the opposite jet to the extent that no rudder trim is required. This usually requires about 85 percent at 140 knots. When power reduction are required on the engine, adjust the jet accordingly. Both jets should be at 60-65 percent across the fence and secured soon after touchdown to preclude the residual thrust from carrying the rollout too far down the runway. The secret of determining the exact point of touchdown is to use power in the reciprocating engine to maintain airspeed on final approach. When the power is reduced from this setting, the airplane will land without floating. This, of course, is identical to the technique used in short field landings, except that power control should not be used excessively if possible. Immediately upon touching down, allow the nosewheel to contact the runway and use reverse pitch on the operating engine. Make sure the propeller goes into reverse before pulling any appreciable amount of power. The nose of the airplane will start to swerve in the direction of the reversed propeller. This can be offset by the use of full opposite rudder. Hold full opposite rudder and adjust reverse power to steer the airplane down the runway with the nosewheel and differential braking. As the airspeed is reduced, reverse thrust and rudder effectiveness diminish somewhat proportionately. Nose steering is usually unnecessary until a speed of about 50 knots is reached. The use of opposite brake at high ground speed with single-engine reverse may result in a blown out tire. This is caused y the pilot's inability to realize how much brake is being used to counteract the unknown effect of unsymmetrical reverse thrust. Should it be necessary to execute a crosswind landing, always choose a runway so that the good engine is downwind. Reversing the downwind propeller will offset the weathercocking tendencies caused by the crosswind component. When a landing is made nosewheel-first, porpoising action of the airplane may be induced for several reasons (usually, too high an airspeed). Unless the pilot makes the proper corrections, the porpoising is apt to increase in magnitude to the point of damaging the landing gear. This holds true for most airplanes with tricycle gears. When contact is made on the nosewheel, the nose is deflected upward, since the CG is far aft of the nose gear. Compression and subsequent extension of the shock strut further influences this deflection. In addition, reaction timing by the pilot may cause him to apply UP-elevator simultaneously or just after the impact. At this point the airplane may be in a nose-high attitude, which the pilot will normally correct with some degree of DOWN-elevator. Since airspeed has been lost by contact with the ground, and because of the nose-high altitude, an abrupt decrease in angle of attack will generally cause the nose to fall through and again contact the ground, even though corrective UP-elevator is applied prior to impact. The subsequent porpoising cycles may become greater in magnitude as airspeed and elevator effectiveness diminish. The only sure corrective action for this predicament is to apply enough power to hold the airplane off the ground with UP-elevator until sufficient control is regained to touch down on the main wheels, or if elected, to take a waveoff. If power is added and corrective control action is taken after the first impact on the nosewheel, porpoising can always be prevented. "Jay R. Beasley Summary Page"